Channel your inner artistic genius while you recreate famous paintings in cross stitch. Transform your needlework from craft into fine art? Cross Stitch Creations: Fine Art shows you how to recreate classic artwork from the masters. Take your needle art to the next level and recreate some of the finest masterpieces in history! 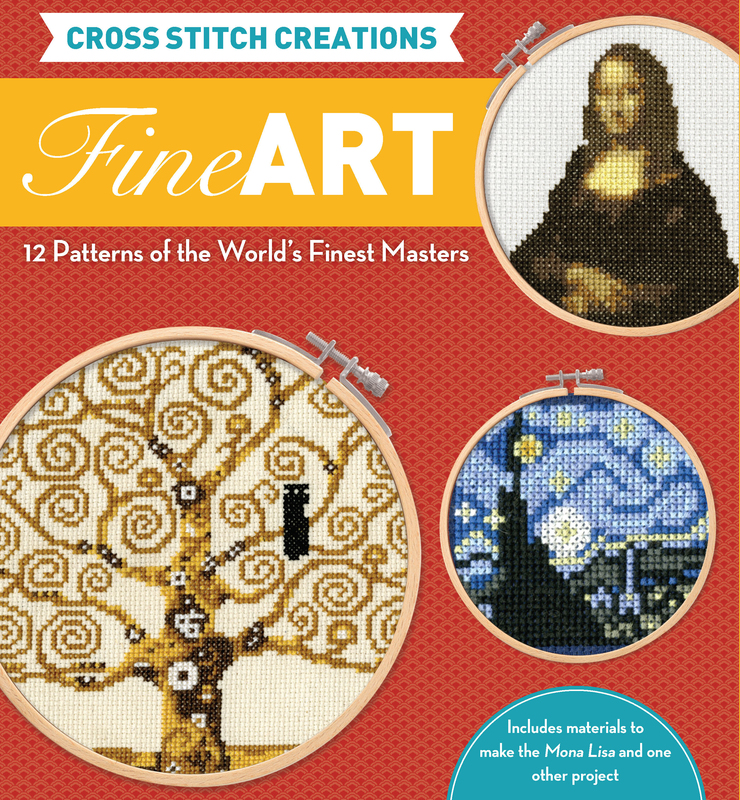 Cross Stitch Creations: Fine Art presents to you a myriad of patterns that will channel the master artist in you. From van Gogh to Klimt to Munch, the projects and artists found in Cross Stitch Creations: Fine Art represent a wide range of art movements in the painting world as a whole. The clear, step-by-step instructions and full-color photographs for the 12 included projects allow you to decorate your walls with the master's most iconic works of art in the classic medium of cross stitch. Cross Stitch Creations: Fine Art includes a 64-page instruction book that details how to create works originally painted by van Gogh, Klimt, Matisse, Hokusai, and many others. The projects are: Composition with Large Red Plane, Yellow, Black, Gray, and Blue by Piet Mondrian; The Swan (No. 16) by Hilma af Klint; Mona Lisa by Leonardo da Vinci; Color Study, Squares with Concentric Circles by Wassily Kandinsky; Curtain, Jug, and Fruit by Paul Cezanne; Sunflowers (Fourth Version) by Vincent van Gogh; Flowers in a Rococo Vase by Paul Cezanne; The Scream of Nature by Edvard Munch; The Starry Night by Vincent van Gogh; The Creation of Adam by Michelangelo; The Tree of Life by Gustav Klimt; The Great Wave off Kanagawa by Katsushika Hokusai. John Lohman is the founder of SpriteStitch.com. He has three published craft books: Star Trek Cross Stitch, Disney Classic Cross Stitch, and Hello Kitty Cross Stitch. He has contributed to World of Geekcraft and Nintendo Power magazine, as well as to popular websites such as Craftzine.com and MrXStitch.com. John is an avid crafter, retro video game junkie, and high school teacher. He lives in southern Oregon.Rhys Turton (Lord Libidan) is a data analyst based in Berkshire, England, who creates cross-stitch patterns inspired by video games, movies, TV, and pop culture. He is a regular contributor to MrXStitch.com and SpriteStitch.com and his patterns appear in Star Trek Cross Stitch, Disney Classic Cross Stitch, and Hello Kitty Cross Stitch. He frequently participates in UK-based conventions and exhibitions, and his writing has been featured in many cross-stitch magazines.